Athletic Trainers, Physical Therapists, Massage Therapists, Nurses, Medical doctors, Acupuncturists, Chiropractors, and other Hands On Therapists. 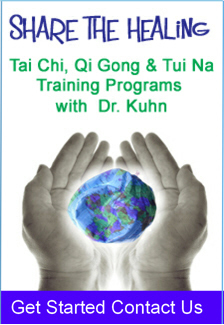 It is recommended that participants take the Tui Na Wellness Course Level 1. If you have questions please Contact Us. This two-day special hands on healing therapy is not only proven to be highly effective, but also well received by patients. Tui Na Neck and back Therapy Techniques involves multiple Tui Na techniques to remove blockages in meridian pathway, promote Qi and blood circulation, relieve pain, and relax the body. For neck therapy, you will learn to use gentle techniques to put cervical vertebrae in proper alignment, relieve pressure from nerves, blood vessels, and cartilage to help relieve symptoms, such as: headache, migraine, TJM, sinus problems, dizziness or lightheadness, brain fog, or memory problems, neck problems, shoulder problems, upper back problems, high stress, anxiety, and heart palpitations. For back therapy, you will learn to identify the root of the problem then using the appropriate techniques to relieve various back problem such as: sciatica, muscle stiffness, chronic back pain, hip pain, knee pain, and more.